What if you could get have all the fun of riding around on a Razor scooter on an off road trail or gravel path? Well, now you can. Razor has developed the RX200 Electric Off Road Scooter. This innovative product will travel over dirt paths, gravel trails, and grassy terrain without missing a beat. Razor scooters gained popularity in the year 2000 when their folding micro scooter was mass produced and millions were sold all over the world. Since that time, the Razor company has grown and expanded to provide more products for a wider audience. 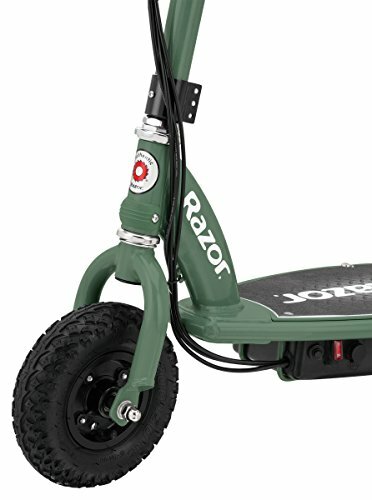 Originally marketed as children’s toys, Razors scooters now come in stand up and sit down models for children and adults. No longer just a sidewalk toy, the Razor scooter is more versatile than ever. Razor’s RX200 is the newest introduction to the market, reaching out to a whole new group of consumers. Featuring knobby off road tires, a beefed up gear ratio for more torque, and a sturdy steel frame, this scooter is the first of its kind. You will no longer be limited to riding on concrete or asphalt. The Razor RX200 offers up to 40 minutes of continuous ride time, powered by 2 x 12 V lead acid sealed rechargeable batteries. This 24 V power system provides enough torque to speed it along at 12 mph, even on gravel or dirt trails. Even though it is designed for off road use, this scooter can not travel through water or mud. Permanent damage to the battery cell and motor can occur if the unit gets wet. The scooter is easy to operate. It has a twist grip throttle to control speed. A hand operated brake lever controls the disc brake system located on the rear wheel. This allows for quick braking and sudden stops. The most unique option this scooter has is its ability to travel off road. This is possible because of a larger gear ratio designed specifically for trail riding. 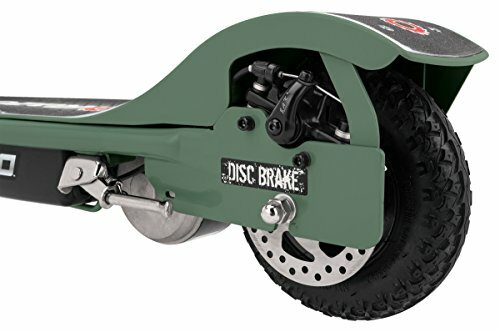 This, combined with the 8″ pneumatic, knobby tread, rubber tires mounted on alloy wheels gives you the perfect off road ride. The powder coated steel fork and frame are painted ranger green to add to that off road feel. The wide deck is completely coated with non skid material for rider safety. Bicycle style handlebars with padded grips provide comfort for even full sized adult riders. This scooter is recommended for riders over 13 years old. 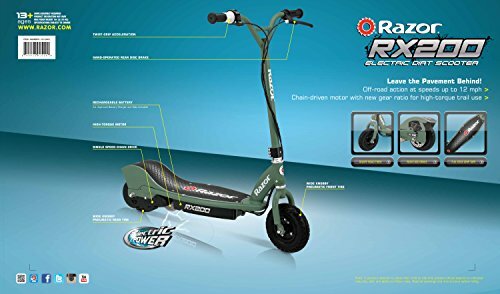 The maximum rider weight is 154 pounds, according to the manufacturer, but reviews have indicated that riders up to 180 pounds have been successful on this scooter. Battery life and speed might decrease with larger riders, though. The battery pack on this unit is recharged by using the included charging cable which plugs into a port on the underside of the scooter. Battery recharging takes a minimum of 12 hours, but the manufacturer recommends the initial charge be 24 hours. A fully charge battery should last about 40 minutes with continuous riding at 10-12 mph. Traveling on hills could cause a shorter battery life. 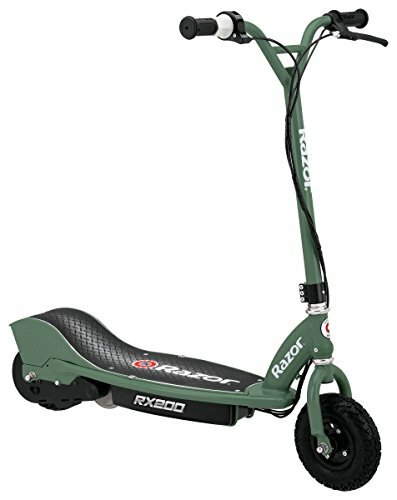 The Razor RX200 provides the convenience of a scooter with the versatility of off road terrain riding. It easily travels over gravel and dirt paths at speeds up to 12 mph. The knobby, air filled tires are strong and flexible, and easily repaired if something happens. Razor has upped the gear ration on this model to provide extra torque for that burst of power you need to power through dirt and gravel. The unit is well made from heavy duty steel. The twist grip throttle and hand operated rear brake make it easy to learn to ride. The Razor RX200 is sturdy, but that also makes it bulky and heavy. The scooter weighs almost 50 pounds. If the battery happens to go dead, this is really too much weight to push. The battery life is only about 40 minutes but the battery takes 12-24 hours to recharge. The battery box hangs below the scooter, giving it very low ground clearance. This could present a problem if you do take it off road. Looking for specifications on the RX200? Make sure to check-out the official Razor user manual. The Razor RX200 is a unique product. It offers the fun of a stand up scooter with the excitement of off road riding. It travels up to 12 mph on 8" knobby, air filled rubber tires. The beefed up gear ratio provides the extra power needed to handle dirt trails and gravel paths. Razor's high quality construction is present, as always. The sturdy steel frame, alloy wheels, and welded handlebars provide long lasting quality.